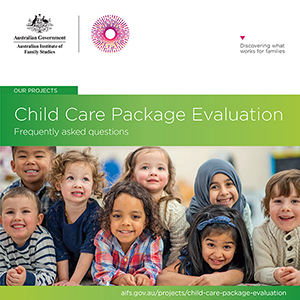 This project is evaluating the Australian Government's new child care package. The Australian Institute of Family Studies (AIFS) is leading a consortium of researchers to evaluate the Australian Government’s new child care package (the Package). The evaluation has been commissioned by the Australian Government Department of Education and Training to report on the outcomes and impacts of the Package for families, services and providers. The evaluation will draw on a range of information collected and analysed over the next three years. This will include information collected from surveys with parents, services (Directors or Managers) and interviews with providers and other key stakeholders. It will also involve analyses of administrative data. the Social Research Centre (SRC). If you would like to find out more about the evaluation, please add your email to our contact list, and we will periodically send an update on evaluation activities. Access more information online about the Early childhood and child care package. The evaluation includes a number of different data collections. A series of case studies will be conducted in order to better understand how the Child Care Package is experienced by childcare services and communities. These case studies involve interviews with local stakeholders; child care service directors, administrators and educators; families who use child care; and families who do not use child care. One case study is underway, with fieldwork completed for wave one, and additional case studies will be undertaken through 2019 and 2020. Interviews with stakeholders are designed to obtain insights into the early impacts of the Child Care Package for services and families, as well as the experiences of providers, services and families. These interviews commenced in 2018 and continue in 2019. As well as interviews designed to explore issues about the overall Child Care Package, additional interviews contribute to the evaluations of the In Home Care program and the Inclusion Support Programme. We currently have two online surveys in the field which relate to the In Home Care program. One survey is for services and the other is for families who are involved in the program. The Australian Institute of Family Studies (AIFS) is leading an evaluation of the new child care package that is being implemented from 2 July 2018. The evaluation has been commissioned by the Australian Government Department of Education and Training to better understand the impacts of the reforms on services and families, and to monitor their progress as the reforms are being implemented. The following document, Child Care Package: Evaluation Framework, outlines the key objectives against which the Package is to be evaluated. This June 2018 version of the Evaluation Framework updates the version published in May 2018. This updated version includes information about additional evaluation work for the In Home Care Program and the Inclusion Support Program. Download Child Care Package: Evaluation Framework [PDF 0.7MB]. A sample of service managers and directors from across Australia were invited to contribute to the Survey of Early Learning and Care Services in May and June 2018. The survey asked about the experiences of staff and families at their service, and about preparation for and expectations of the Package prior to implementation. This survey is now closed. We plan to do a second wave of this survey in 2019. Thanks to all who responded to the survey. The Child Care Package Family Survey was conducted in November 2018, and is now closed. This online survey asked selected parents and carers about their transition to the new child care subsidy, and about whether their child care use and cost has changed since July 2018. The five randomly selected recipients of gift vouchers were notified; we thank all families who participated. We plan to do a second wave of this survey in 2019.